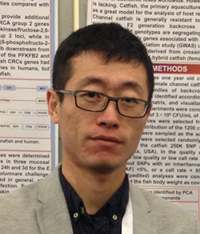 For Ph.D graduate student Xin Geng, conducting Genome Wide Association Study (GWAS) to uncover the quantitative trait loci (QTL) controlling disease resistance in catfish was not just an interesting study, but potentially the start of finding a way to improve the economics of the aquaculture industry in the United Sates and China. Before coming to the United States as a graduate exchange student, Xin Geng graduated from Ocean University, which boasts one of the top agricultural programs in China. Geng's passion for agrigenomics, stems from the importance of agriculture on China's economy and his desire to conduct research that has economic significance. Disease can greatly devastate agricultural production and thereby hinder economic growth. By identifying the QTL controlling disease resistance, agricultural production rates as well as the impact on a nation's economy can be increased. Currently, Geng attends Auburn University, which like Ocean University, is one of the best agricultural programs in the United States. Working in the Fish Molecular Genetics and Biotechnology Laboratory at Auburn, under Dr. John Liu, Geng and his lab mates have a very broad focus from DNA marker technologies to population genetics to QTL mapping and much more. At the time however, Xin was the first person in the lab to conduct a GWAS. Without a solid background or experience in Linux or R, lab director Dr. Liu favored the use of a software that had a user-friendly interface in order to save time. The lab decided to try the SNP & Variation Suite (SVS) because of the training and support that was available, as well as the easy-to-use setup. "I think your support team is very helpful and they're always there to help solve our problems," said Geng. Given the support and training he received, Geng believes it took a much shorter time to learn GWAS using SVS than through other free software options. And he has been able to put his new skills to work. Geng and his colleagues recently published "A genome-wide association study in catfish reveals the presence of functional hubs of related gene with QTLs for columnaris disease resistance" in BMC Genomics. Since catfish production accounts for a significant percentage of US aquaculture the disease in blue catfish, channel catfish, and their hybrids are of particular interest. Unfortunately, the industry has lost about one quarter of its production due to diseases, especially columnaris disease. In fact, columnaris causes mortalities in several different fish species, causing millions of dollars of losses. Catfish are an excellent model to test resistance against columnaris as some catfish species are very susceptible and others are resistant. The purpose of the study was to identify genes associated with resistance to columnaris using GWAS and use the genetic findings to improve the catfish stock. The results of the study showed that four QTLs were associated with columnaris resistance. In their words, "The most interesting discovery of this work is that functionally related genes that may be responsible for columnaris disease resistance are located closely in a limited number of positions, forming 'functional hubs'." Future work will be conducted to determine if the co-localized and functionally related genes are conclusively expressed in a coordinated fashion. Presently, the lab is focused on three GWAS projects including Geng's study, which focuses on the selection of QTL controlling disease resistance in catfish. Other GWAS studies include hypoxia, low oxygen tolerance and body formation in catfish. Using SVS to conduct a successful GWAS study and publish a paper has put Xin Geng one step closer towards impacting the economics of the aquaculture industry in the United States. Additionally, a major benefit was realized from the recent publication as additional funding was awarded from the Agricultural and Food Research Initiative Competitive Grant, so Geng can continue his research. Helping farmers breed fish that have a higher resistance to common diseases will hopefully lead to fewer deaths over time and an increased profit.